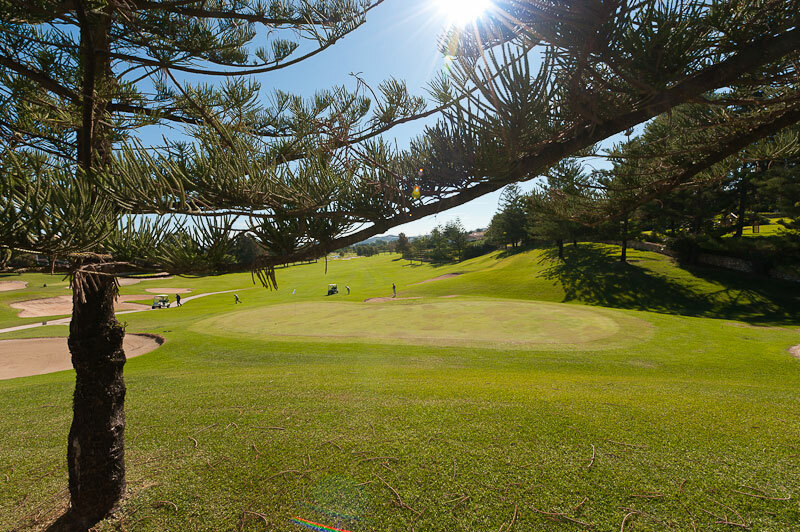 Mijas Golf is a prestigious urbanisation ideally located within 15 minutes’ drive of the coastal resorts of La Cala de Mijas and Fuengirola. 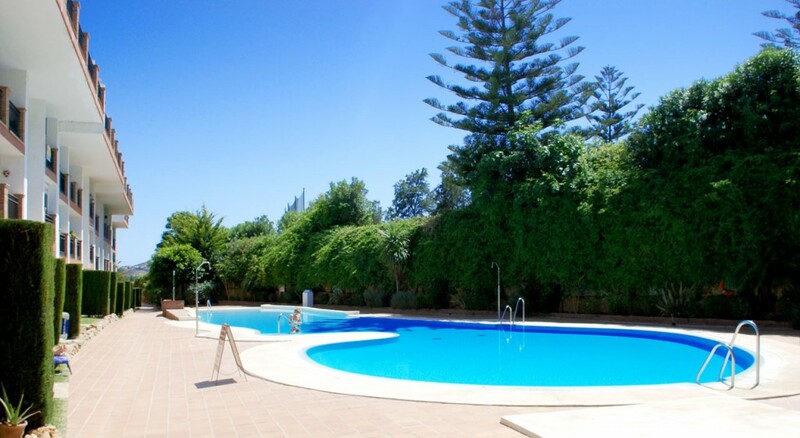 It is also just 15 minutes’ from the pretty inland village of Mijas and within easy reach of Malaga Airport. The cosmopolitan resorts of Marbella and Puerto Banus are also a half hour drive away. 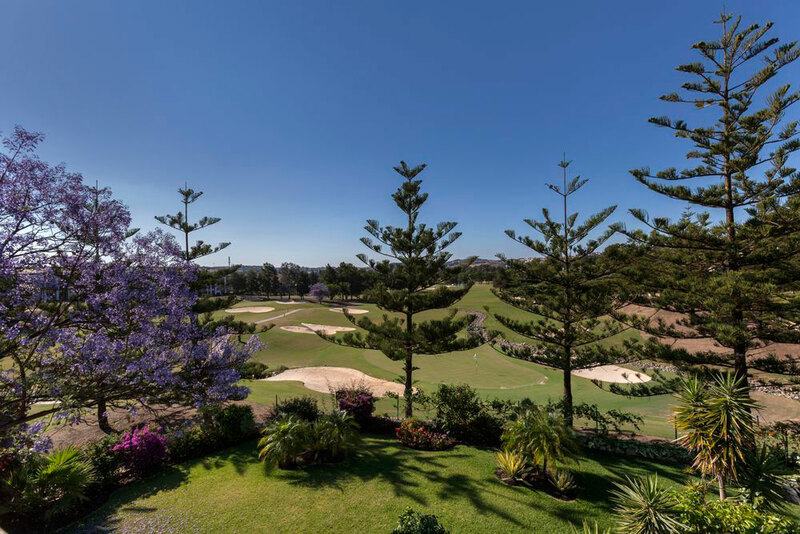 The Mijas Golf Urbanisation has a vast range of accommodation; from modern apartments to townhouses and luxurious 3, 4, 5 and 6 bedroom Mijas Golf Villas with golf course views. The urbanisation covers a large area and you can easily find the best spot for you depending on the facilities you want nearby and the proximity to the golf course. 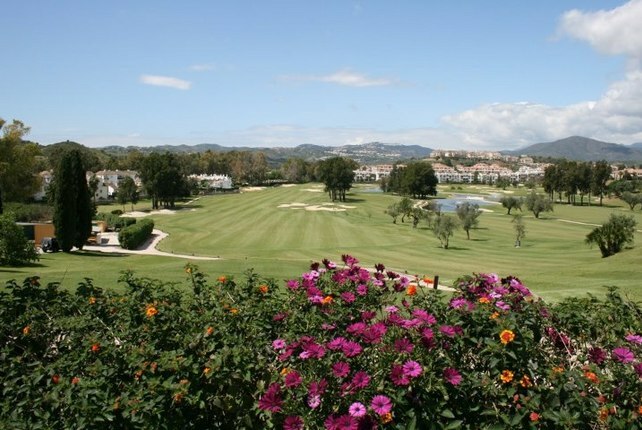 The most obvious facilities on the Mijas Golf Urbanisation is of course the two 18 hole championship golf courses. Los Lagos is the larger of the two courses, measuring 6536 metres and covered in an abundance of trees. Lago means ‘lakes’ in Spanish so it’s no surprise that there are no fewer than 9 lakes on this large course. 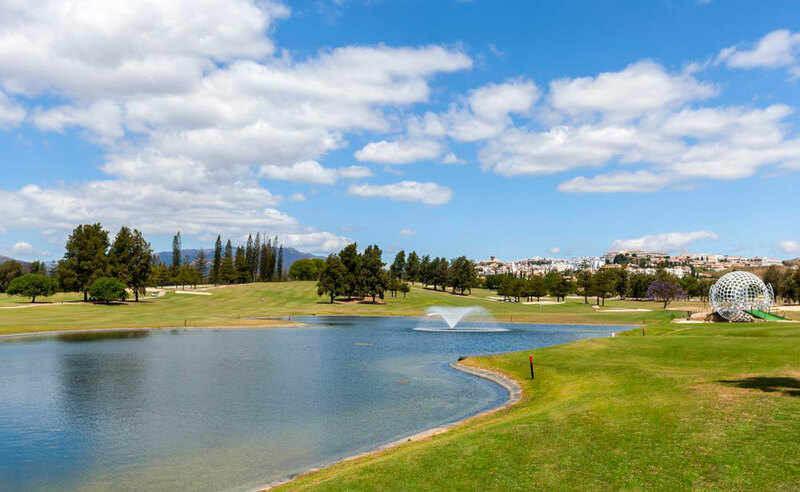 The smaller course, Los Olivos has only one lake but lots of narrow fairways and more slopes to tackle. The Club House at Mijas Golf is home to a restaurant housed in a traditional Spanish farmhouse. Residents and guests on Mijas Golf are welcome in the restaurant to sample international and traditional Spanish cuisine. 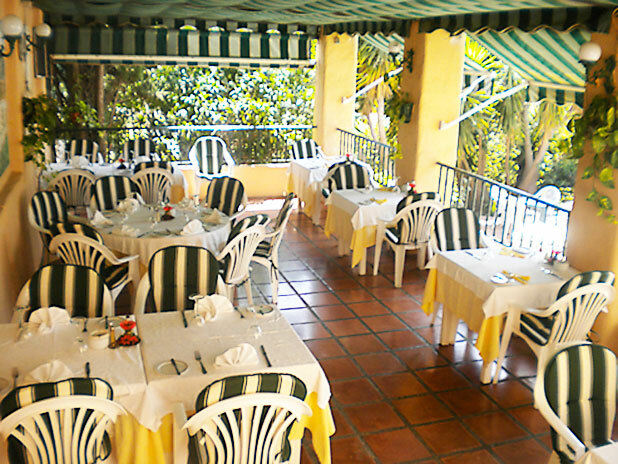 If you want to dine out on the terrace with great views of the green visit the imaginatively named ‘Restaurante El Golf’ that is situated right next to the 5th hole on Mijas Golf Course. You can also take in views of the Mijas Mountains from the mezzanine or enjoy cocktails in the bar. There are numerous eateries dotted around the urbanisation including the restaurant at the Matchroom Country Club, Italian Restaurants, a pizza takeaway and a Chinese restaurant. There are several communal pools on the urbanisation nestled in between the beautiful mature gardens. Guests staying in apartments and townhouses on resorts will usually have a pool very close by and the majority of villas have gardens with private pools. 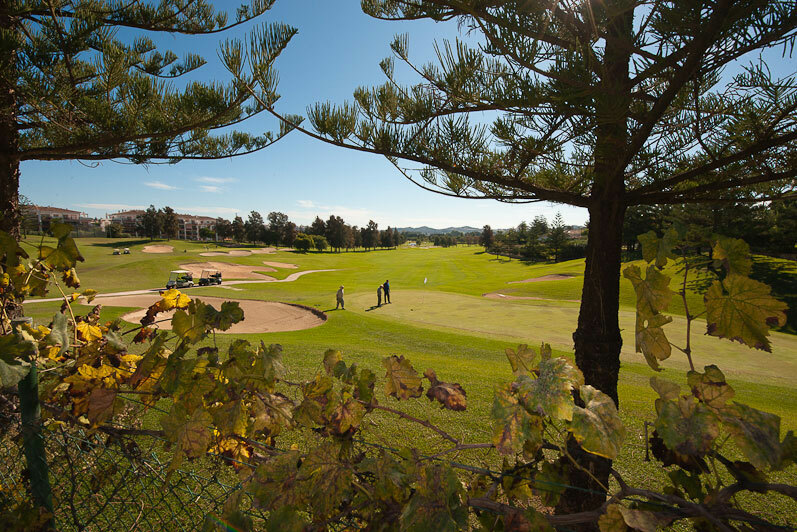 Mijas Golf is so well located that there are literally hundreds of activities nearby to choose from. If you like the outdoors there are fantastic walking, cycling and climbing opportunities just a short drive away in the Mijas Mountains. You can also go on jeep safaris, go trekking on horses, or try quad biking. If you prefer getting active on the water there are watersports from sailing to jet skiing on offer in Fuengirola and La Cala de Mijas. 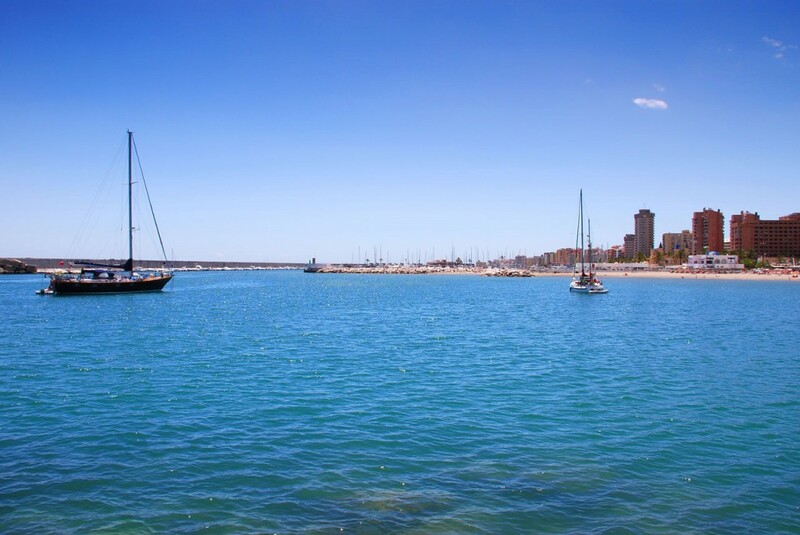 Fuengirola is great for watersports, why not try sailing or jet skiing which are both fantastic fun! If you are travelling with children there is plenty to keep them occupied. Fuengirola Biopark is an award winning zoo with a focus on conservation. There is every species from meerkats to white tigers here and it is definitely worth a visit. 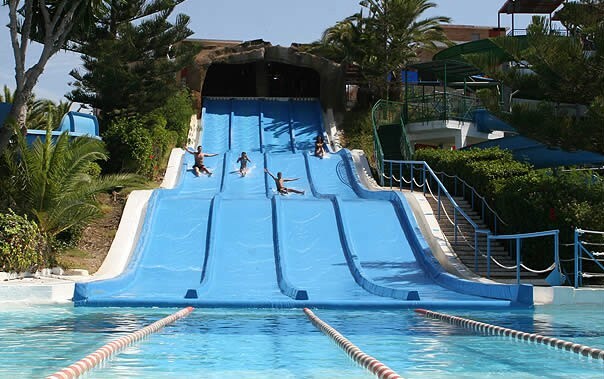 There is a great waterpark in Fuengirola that has slides and water attractions to suit kids of all ages. Just a bit further down the coast in Benalmadena there is a Sealife Centre full of interesting marine life and Tivoli World theme park that has lots of great rides. 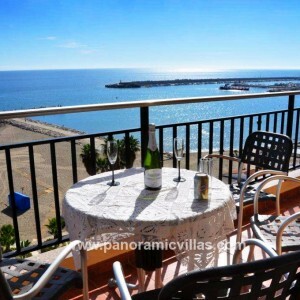 For cost-free fun why not hit the beach in La Cala de Mijas or Fuengirola? The sand here is soft and great for making sandcastles. There are plenty of sunbeds with parasols if you need the shade too, it’s a family friendly stretch of coast. 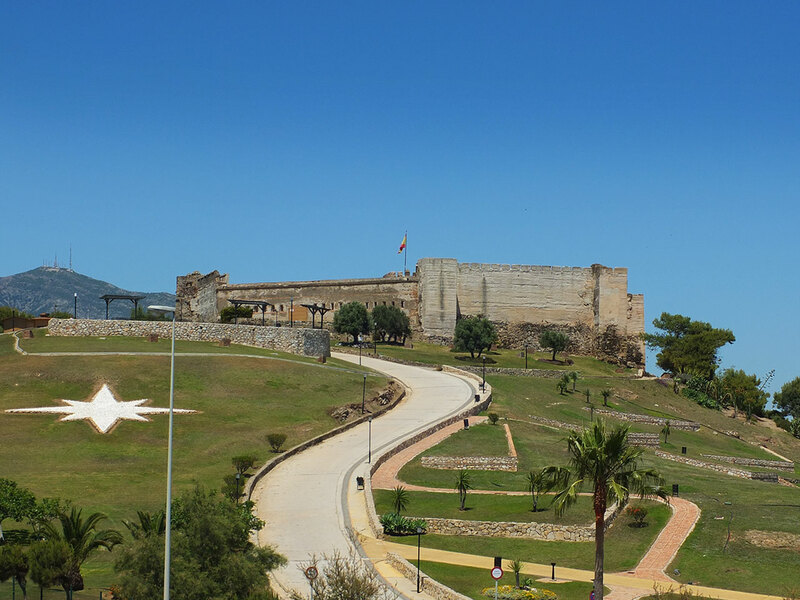 Historians should pay a visit to nearby Fuengirola Castle that sits perched on a hill over the town. It is an impressive landmark and you can climb up to the castle and walk around the battlements. The view is also pretty impressive from up there. Mijas Pueblo is also steeped in history and still retains its traditional Spanish charm. You can visit one of the only oval shaped bullrings in Spain here or take a walk around the narrow streets and have some lunch on the main square ‘Plaza Virgen de la Pena.’ The Church of the Immaculate Conception sits high up in the village, surrounded by pretty gardens that you can wander around and take in the great views down to the Mediterranean. La Cala de Mijas has a laid back atmosphere with small local restaurants and seaside chiringuitos serving seafood. Fuengriola is brimming with great restaurants. Fish Alley is the famous place to go to find restaurants serving cuisines from all over the world; Indian, Italian, Mexican, Chinese… If you venture down the narrow streets just off the seafront you can also find little squares with restaurants on and tapas bars tucked away that serve great food and wine at very reasonable prices. Fuengriola comes alive at night with lively bars and nightclubs that stay open until dawn. Avoid if: You don’t want to hire a car. Mijas Golf is very well located but in order to fully take advantage of all the amenities on offer nearby we recommend hiring a car. Go there if: You want to stay in a top quality villa or apartment that is close to one of the best golf courses on the Costa del Sol. 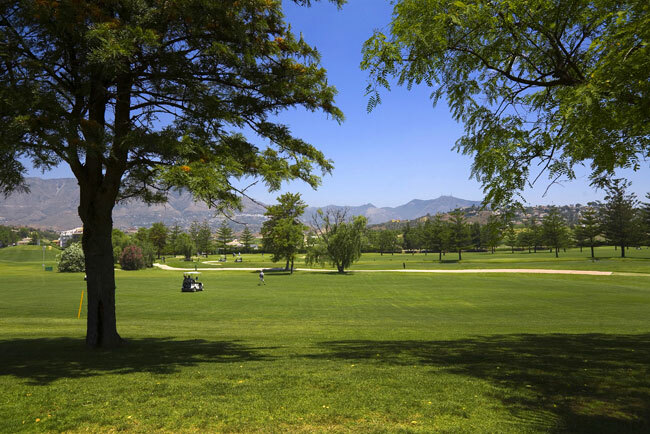 Mijas Golf offers fabulous mountain views and lots of green space, despite being close to large resorts on the coast. 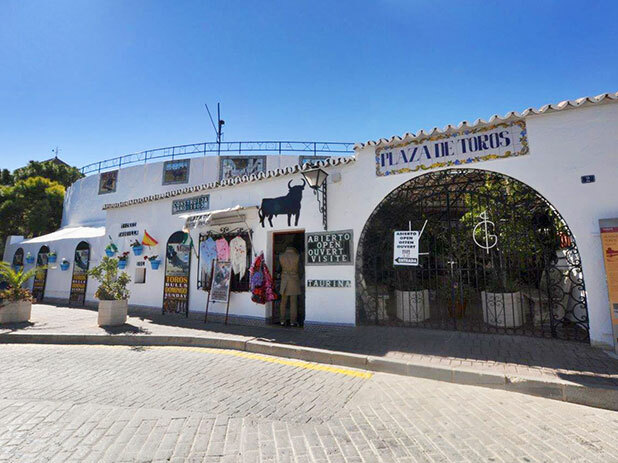 This entry was posted in Benalmadena, Costa del Sol, Fuengirola, La Cala de Mijas, Mijas, Mijas Golf, Spain and tagged Activities & Sport on April 10, 2014 by Jess Whittle.